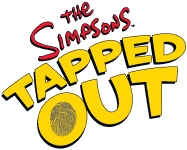 The Simpsons: Tapped Out received an in-game update today which adds level 31 along with other new features, decorations and enhancements. 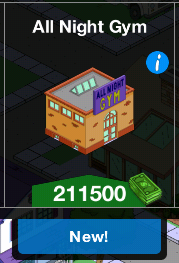 The update is installed automatically when you start the game. 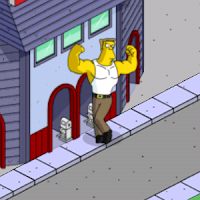 Lets take a look at all the new features which you will receive with the Level 31 update of The Simpsons Tapped Out. 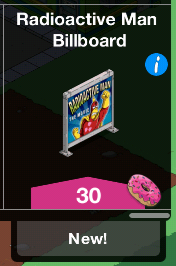 If you have already made your way through the levels and have passed Level 30, the new Level 31 will be already waiting for you once you install the update. 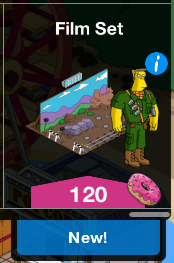 You will be immediately awarded 2 doughnuts for reaching level 31. 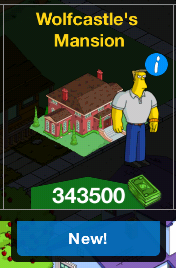 Celeb-o-mania Pt.1 - Clicking Mayor Quimby initiates the Quests and you will be requested to build Wolfcastle's Mansion following the first dialog. The building will take 1d and 12h to complete. The All Night Gym will also be unlocked and will take 24h to complete. You will be awarded 100 and 10 for completing each item and will unlock Rainier Wolfcastle ( 25) who will complete the set for B-List Celebrities for 750 and 15. Now With Extra Hype - Click on Wolfcastle to start the next mission where he will want to promote Planet Hype for 16 hours. You will be awarded 100 and 10 once completed. Celeb-o-mania Pt.2 - Following a dialog with Mr.Burns, Wolfcastle exercise for 4 hours. Egoin' Crazy Pt.1 - Krusty feels that his position as local celebrity is under threat now that Wolfcastle is in town and spends 6 hours Inflating his own importance. You will be awarded 100 and 10 once completed. Egoin' Crazy Pt.2 - Kent Brockman is unhappy that Wolfcastle was picked for the job instead of himself. As a result you have to make Brockman Record Eye on Springfield for 12 hours. The task will award you 500 and 110 for completion. 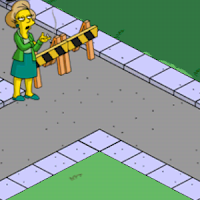 Make sure that Mr. Burns is free for the next task. 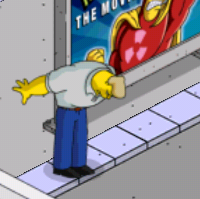 Celeb-o-mania Pt.3 - With the new distractions around town, Mr. Burns decides to lighten his pockets and attempting to hide his Nuclear Waste while no one is looking. 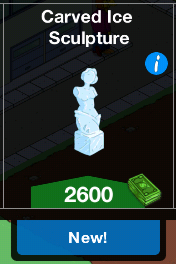 The task will take 8 hours and you will be awarded 375 and 80 for completion. 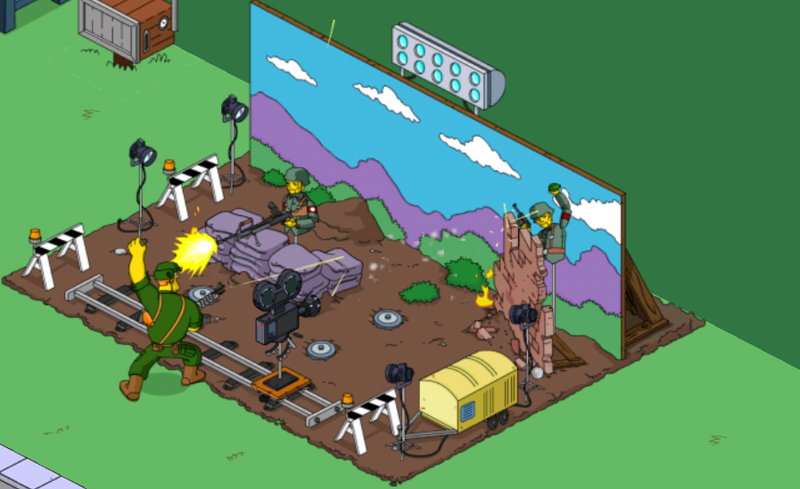 Climbing Up to The D-List Pt.1 - Following a conversation with Cletus, Wolfcastle heads to Cletus' farm to shoot a show. 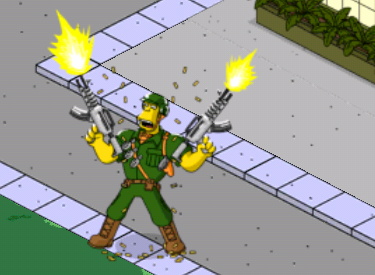 and make Cletus Yokel it up. Both tasks take 12 hours each and you will be awarded 940 and 210 for completion. Climbing Up to The D-List Pt.2 - Cheif Wiggum complains that he has not been put on television and convinces Wolfcastle to cast him in a cooking show. The show will be shot at El Chemistri and will take 12 hours to complete. 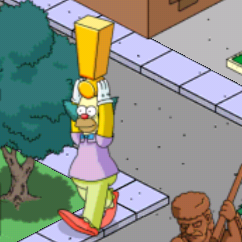 Climbing Up to The D-List Pt.3 - Wolfcastle now interacts with Homer, who seems to have stolen his dinner. Now Homer wants to eat the famous Guatemalan Insanity Pepper in a task that will take 12 hours to complete. You will be awarded 420 and 100 for completion. Celeb-o-mania Pt.4 - Principle Skinner needs to find a distraction for Ms. Krabappel so she doesn't ask for a raise. He asks Mr. Burns who calls on Wolfcastle to distract Ms. Krabappel. Egoin' Crazy Pt.4 - Wolfcastle is not happy with Brockman's cyber bullying and intimidates him. 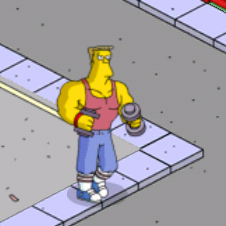 Brockman attempts to distract him by asking Wolfcastle to check if his laces are untied. When the mission ends Bart claims that 'Real' housewives bore him more than the Real Housewives show. 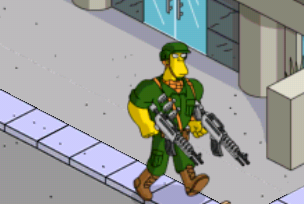 Find and click Smithers who will tell Wolfcastle that Mr. Burns has an assignment for him. Celeb-o-mania Pt.6 - You have to make Woldcastle Appear on a Talkshow. The task takes 60 minutes [ 70 17] You get 100 10 for completion. Celeb-o-mania Pt.7 - Wolfcastle is unhappy with his jobs and neighbors in Springfield and heads over to hi Relax in his Mansion for 24 hours [ 600 150] You get 100 10 for completion. Climbing Up to The D-List Pt.6 - Wolfcastle's reality show is about to get cancelled and he swears vengeance on the Springfield TV networks. He decides to blow off some steam with 4 hours of exercise [ 600 150] You get 100 10 for completion. Egoin Crazy Pt. 5 - Click Wolfcastle and tells Mr. Burns he is through being his Lacky. He also says he is ready to go into making movies.This leads Wolfcastle to start shooting action footage for 12 hours [ 420 100] at Channel 6 studios. You are awarded 100 and 10 for completion. [NOTE] If you want to purchase the premium film set, you can continue the story below. If not skip the next section all the way to the end of this post. 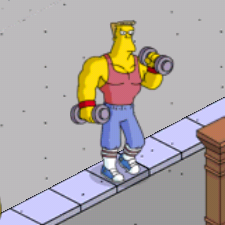 Prologue: Up Late with McBain - Wolfcastle returns as MacBain and wants to try out comedy instead of action films. 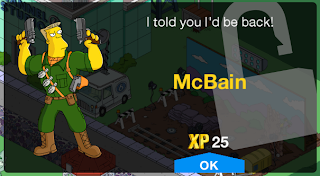 He starts by hosting Up Late with McBain for 4 hours [ 260 70] You get 100 10 for completion. 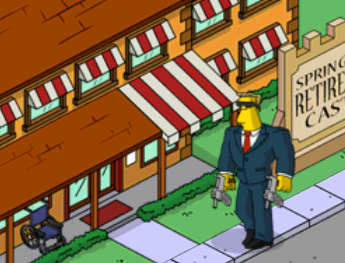 McBain, Scene 1: Vengence, Thy Name Is - Following a conversation with Mayor Quimby, McBain head over to the (Springfield Downs) track to find intel. [ 750 200] You get 100 10 for completion. McBain, Scene 2: Master Of The Disguise - McBain is still on the track of Mendoza and will go undercover for 12 hours [ 500 150] You get 100 10 for completion. McBain, Scene 3: Big Explosion - Make McBain battle commie nazis for 8 hours [ 420 105] to save the power plant. You get 100 10 for completion. McBain, Scene 4: Bad Cop, Bad Cop - Wiggum is not happy that Wolfcastle is playing by his own rules and wants him to turn in his badge. The task takes 60 minutes to complete [ 105 26] and you will get 100 10 for completion. Dr.Hibbert is included in the final scene of the movie to convince McBain that Mendoza is no more. The director yells cut its a wrap and the film is successfully completed along with your mission. You will be awarded 100 10 for completion. That's it folks. 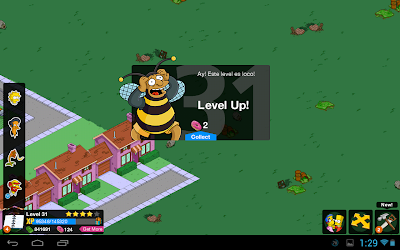 The end of Level 31. 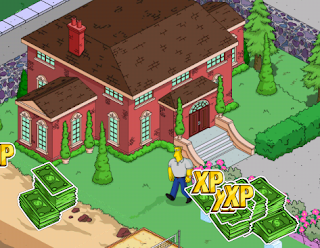 You can continue the adventure with the Springfield residents on our Level 32 walkthrough.